The Customer Display app lets you display itemized order information to your customers on a separate digital display without interrupting the payment flow in the Square app. To begin set up of your Customer Display, you’ll need to have a supported iOS device. We currently do not support Andriod devices for your Customer Display. 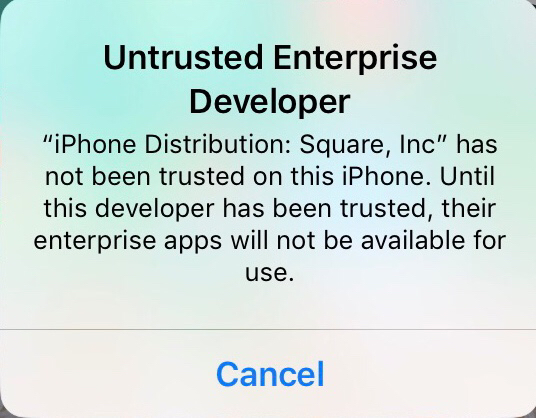 You must be running the latest version of iOS on your iPad and the most recent version of the Square app to use the Customer Display. 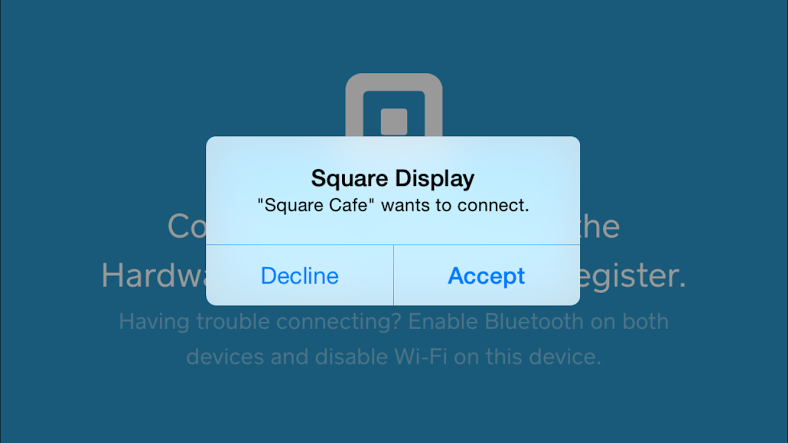 Learn how to update your device’s software and the Square app. Note: Devices unable to update to iOS 10.0 or higher (e.g. iPad 2) are no longer supported. To download the Customer Display app, visit squareup.com/beta/display and enter the code: displaybeta. Note: If you see the prompt below while downloading the app, tap Settings > General > Profiles & Device Management > tap your profile > tap Trust or Verify. Tap the three horizontal lines to access the Square Point of Sale settings and then tap Customer Display. If you don’t see Customer Display, please let us know. Note: Verify you have WiFi enabled on the device running the Square POS App and the device running the Customer Display. Also, please ensure that bluetooth is disabled on the device running the Customer Display. Square Point of Sale will search for nearby devices. Once the device running the Customer Display app appears, tap that row to pair the devices. From the Customer Display app, tap Accept to complete device linking. On both devices, make sure Auto-Lock is set to Never from your device’s settings. To do so, tap General > Display & Brightness > Auto-Lock. Note: The devices will unpair if either device locks and/or if you switch/close out of ethier app. Make sure to keep your devices’ turned on when paired. The devices should now be connected. To test the connection, add an item to your cart in the app and check that it shows on the Customer Display. Make sure you’re running the latest version of the Customer Display app. To update the app, visit squareup.com/beta/display and enter the code: displaybeta. Tap Update. The app will automatically update in the background. Ensure Bluetooth is disabled on your device the Customer Display app. On the iPad, with the Customer Display app installed, make sure Wi-Fi is turned on. On both iPads, make sure Auto-Lock is set to Never from your devices’ settings. To do so, tap Settings > Display and Brightness > Auto-Lock > Never. Note: The devices will unpair if either device locks and/or if you switch/close out of either app. Make sure to keep your devices turned on when paired. You may have trouble if one device is on an old Apple iOS version and the other is on a newer version. Be sure that both the Square Point of Sale app and the Customer Display app are running on devices with the same, up-to-date iOS and the most up to date version of the Square Point of Sale App.